World Vegan Day: Are Nigerians finding veganism to be 'hip' enough? Today is World Vegan Day. From experience, such information is usually received by the majority of Nigerians in two ways – “oh, okay” or “what’s that?”. Because, veganism, for all it embodies and represents, is not a common or popular lifestyle choice in Nigeria. 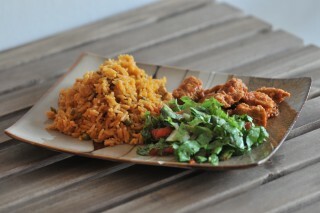 At the most elementary level, a lot of Nigerians are not aware of the differences between being a vegetarian and being a vegan, speak less of the philosophies behind veganism which extend beyond an individual’s decision to lead a healthier life for themselves to having the interests of animals and the environment at heart, amongst other personal and ethical reasons. In a country such as Nigeria, however, top on the list of reasons to understand more about veganism would be our record of poor diet practices. Despite having a wealth of healthy food options to choose from, the sixth cause of death in Nigeria is protein-energy malnutrition, and in September, leading medical experts in the country linked Nigerians’ unhealthy dietary intake to cancer. Being a vegan might sound unappealing to a lot of Nigerians because first and foremost giving up meat of any kind seems uncontemplatable, yet more people around the world are finding that opting for this choice is more important for most than maintaining their carnivore status. 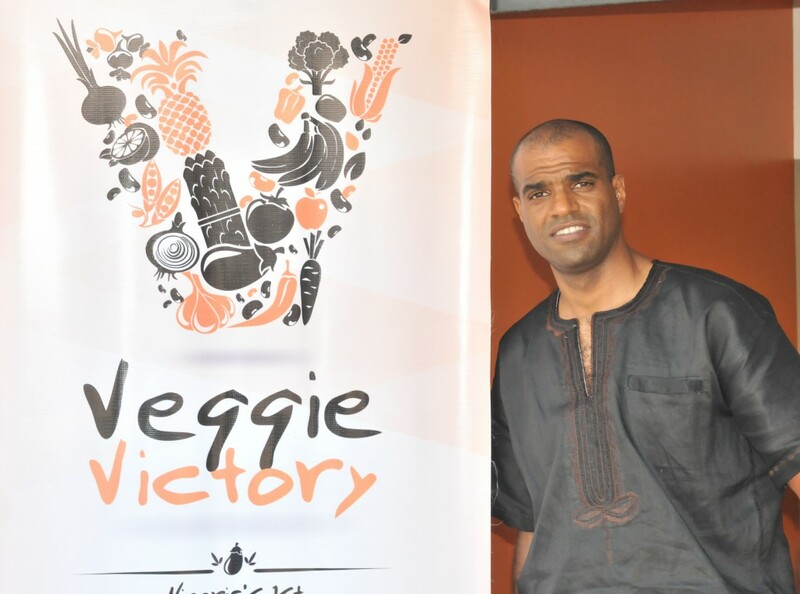 While being a vegan–or vegetarian–is not about forcing anyone or everyone to give up eating meat, Hakeem Jimo, Founder of Nigeria’s first vegan and vegetarian restaurant, Veggie Victory, explains why more Nigerians need to consider a healthier lifestyle on this year’s World Vegan Day. 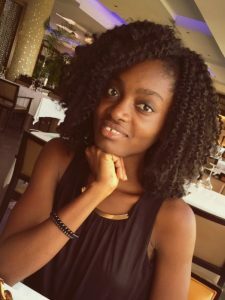 Ventures Africa: Veganism is much more than just having a healthy diet obviously, but will you say that people know enough about that aspect in Nigeria, for example, especially as the lifestyle and the event World Vegan Day is one that is still gaining momentum in Africa? Hakeem Jimo: The vegan concept is not yet very known, and it starts already that we call our restaurant Veggie Victory, because we noticed four years ago that people don’t even know the term “vegan”, and many have no clue, which is okay, you can’t know everything. But it really starts there. So it’s not very common, even in other countries. It’s just a new concept that, I don’t know, maybe really gained momentum like ten years ago. Although vegetarian[ism] is known, vegan[ism] is really a new movement, and in Nigeria, there is [a] very little tradition of veganism. But it’s also very important because people of African descent are actually a lot lactose intolerant. A study shows that over 90 percent of Nigerians, broken down by their ethnic group are actually lactose intolerant. [Many] people don’t know about the World Vegan Day, and I’m even happy when some people know about the World Vegetarian Day. But we are here to let people know about the healthy aspects–the healthy lifestyle, that is what is catching people. People understand, they see it every day, they have to change their behaviors, mostly their eating behavior. They are figuring it out that too many modern diseases like diabetes, blood pressure, hypertension, heart problems are food related so they are getting into it, and then understanding that a 100 percent plant-based diet is best for you. That’s what we do. VA: Would you say that people should be more interested in the aspects that include animal rights and the environment, as opposed to just wanting to have a healthy diet? HJ: You know, I’m trying to keep things simple and not overload people. It’s more of an educative thing, and we could overwhelm people with too much. I know, abroad, the main drive of the vegan or even vegetarian movement is the animal rights because they realize that the animal, livestock industry is just crazy, with the effect on the environment and also, well, the ethical standard. I’ve been a vegetarian for 20 years, and a vegan for five years now. I have these conversations every day. I know that very few people are worried about the ethical standards right now, the animal rights. You could come with animal rights and people would say, “What about human rights?”. What drives people in Nigeria particularly is the health aspect. They realize they should go on a plant-based diet. Maybe you heard about the Lagos Veg Fest. That’s also a vegan day festival and during that festival we have two/three speakers’ slots on animal rights. So we have that topic on the radar but we don’t want to push it to the front because then a lot of other people will start putting their agenda into it and then it’s not helping the whole cause. But definitely, I think the ultimate reason is actually ethical. There are many reasons. There is the ethical dimension like you said. There is the individual health dimension, which is paramount to Nigeria, and there is also the environmental dimension which is really becoming clearer to people. I’m sure you know about the Fulani herdsmen and the grazing rights. They are pushing down to areas that have not seen this kind of problems, such as Enugu and Ekiti. Livestock is the very expensive way of producing food. They are pushing further south and they are now clashing with areas in the Middle Belt. So that’s environmental problems. I think all three aspects have their own priorities, I’m not saying one is higher than the other one. VA: What inspired you to change your lifestyle? HJ: Well, I was in my early 20s, so I had no problem. I didn’t know about blood pressure or hypertension (laughs). When you are in your 20s, you are fit. I was in Germany then, they were a lot of food scandals. I’m sure you remember the mad cow disease when the cows were walking like they were drunk. There was bird flu… and you just think about it and say, “Are we eating all that?” But that was not the final push. When I then travelled to Africa as a vegetarian, I felt like, “I don’t have any problems. My system is working fine.” Then I met more like-minded people in the university, and I realized there is a lot more concept behind this. You feel lean, you feel lighter because you are not straining your body with digestion issues (meat takes five days to digest). And once you feel something is going good, you’re not stopping. VA: Do you have children, before I move to the next question? HJ: Yes, I have children. I have three; they are all vegan or vegetarian. VA: I was going to ask if they are vegan or vegetarian by choice or it’s because of their parents’ influence. HJ: (laughs) I don’t think any child has a choice. You grow up in a household and then you see the customs, and then at some point, you make a decision. You can say, “I don’t want to be a Christian anymore I want to become a Muslim”, fine but not when you are five. My oldest daughter is 15 and she is a stern vegan. If she would say today, “I wanna eat meat”, no problem! But she is so convinced, and she convinces and inspires other children. I don’t think that my children are going to become carnivores again, but if it happens, it’s a free world. But as long as you are living in the household, you do as your parents do. We are very open-minded. It’s a decision we take together as parents. We have a 2-year-old and an 8-week-old, and they are vegetarian and vegan. The newborn is still breastfeeding, and if you do 100 percent breastfeeding, your child is vegan. Naturally, I think we [humans] are definitely more vegan. The dairy came much later when we started to domesticate cows and other animals. That’s another story for another day (laughs). VA: Was it challenging for you to maintain your lifestyle choice, as well as Veggie Victory, when you moved here? HJ: Well, I always noticed if you have the support network around you, it’s easier. It’s like if you want to lose weight; if you have a bunch of people that always eat chocolate, it’s difficult. But if you have people that help you to lose weight it’s easier. Abroad, for example, you have so many restaurants, every supermarket has vegan and vegetarian options, and you have purely vegan restaurants, so it’s super easy. In the case of Nigeria, it becomes difficult. I’m not going back to meat, but I know some people are struggling with it because you cannot, for example, just walk into a buka or restaurant because it’s almost certain that everything that is cooked there has crayfish or stock fish in it, or whatever they want to put. So, you have to build your own network. I always advise people to make friends with a few bukas so they always have something for you. Eating is not really a problem, there is always something, and when you become a vegetarian you will see that your metabolic system is also changing. So you are not having these food cravings, like you are going to die if you don’t eat meat now. If I really can’t find anything, if I’m travelling in some villages or so, there’s always somebody roasting corn, or there’s banana with groundnut. Then I’m fine. You can do that in some cases. But for your daily living, you need to find ways and how to cook. What we notice is, the main problem is people want to become vegetarians, but after two days of eating salad, they are becoming frustrated. VA: That is exactly why I asked. Because of variety. HJ: At our restaurant, we have everything. 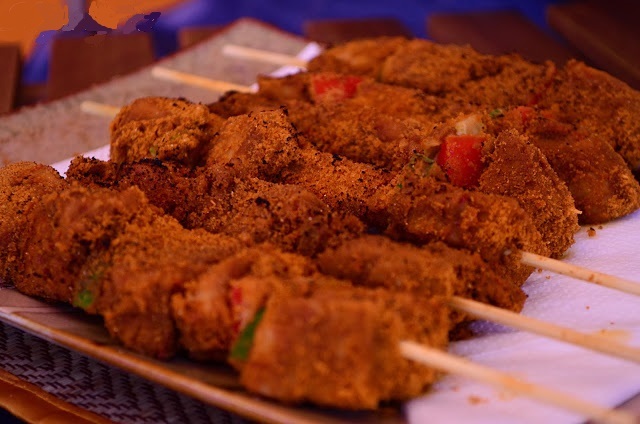 We have egusi, efo riro, jollof rice, even pepper soup, we have suya made with veg meat–meat, but plant-based. We have three kinds of meat: one is tofu, made from soy beans, one is wheat, and there’s even one that is made from cashews. Three months ago, we launched a veg meat product that is in retail now, so people can buy it. A lot of people came to us and said, “Your restaurant is cool, but we cannot always come here to eat food”, you know, because there’s only one restaurant. So after getting NAFDAC approval, we have a product called Vegetarian Chunks, and it’s a great product. Its N500, and it’s very affordable. And that’s what I mean by supporting. Now everyone can have a meat substitute at home. You can cook with it, you can do noodles with it, you can eat it with your jollof rice, and it’s very simple, it has a lot of advantages, and it’s cheaper than meat. And if you go out you’ll know how to find your food. 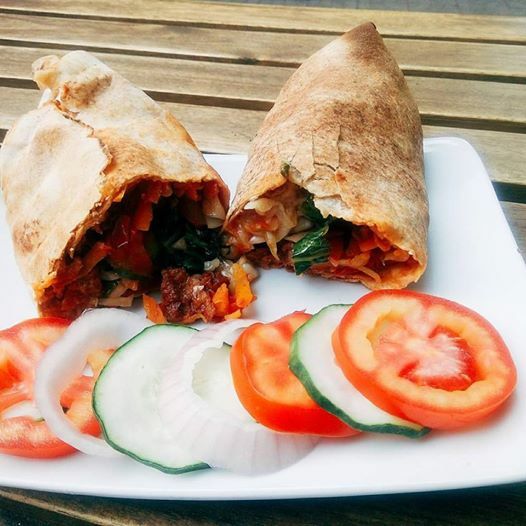 VA: Judging from the reception of Veggie Victory restaurant and from the annual Lagos Veg Fest, would you say that Nigerians are healthy eaters, irrespective of whether they are vegetarians or vegans, or not? HJ: The problem is that we have some medical numbers that are terrible. Diabetes is going through the roof, just talk to a Nigerian heart foundation. 100 million Nigerians have blood pressure, and blood pressure is not something funny. You die of it. It will weaken your heart. ‘100 million Nigerians’ means almost every adult Nigerian has blood pressure. We are not alone in Nigeria. There are countries like Mexico and Kenya that have the same thing. Because we are switching to a more ‘modern’ diet – more processed foods – and that comes with a lot of downsides. We are not eating healthy anymore, you know. If you are in the village or from our grandparents’ generation, you are probably eating healthier, but the younger generation, the ‘junk generation’… I don’t want to scare, but a lot of people are now dying in their 30s and 40s. I was at the Babcock University the other day because they promote the vegetarian lifestyle. The head of the food department told me that one out of three students already has diabetes or blood pressure. Blood pressure is a big killer in this country, also heart diseases. So we have to change our diet because we eat a lot of fried things and too much meat. I’m not saying meat is the only problem, but it is a big chunk of the problem. Then, you need to exercise and have more fruits. Every food pyramid in this world will tell you that you need to change to fruits and vegetables. We have a national crisis. So, first of all, reduce your meat intake. We give people now the option to do it. Because we have a really great substitute that tastes like meat, and we have great feedback. And then eat more vegetables, more exercise, don’t eat too much food or processed foods and reduce your salt intake, then you are fine. VA: What does it mean to you that there is a day set aside to commemorate veganism throughout the world annually? HJ: It’s all about awareness. I like that they are picking a day to draw awareness to topics that should have more attention, like World Women’s Day, World Children’s Day, or World Malaria Day – topics that could help humanity. With veganism, people realise [that] if you want to live in harmony with your body and nature, that’s really the way to go. Also saving the planet in terms of climate change. Did you know that livestock is the biggest contributor to global warming? We are already living in global warming, and a lot of people are facing the consequences, but we are not yet changing the sources. But we are getting there. VA: How do you think we can promote veganism itself? Like you said, people have their own choices, it’s all about balance and what you think your body can manage. How do you think we can promote awareness of not having a balance in our society because we are mostly carnivorous? HJ: That’s exactly what I’m thinking about every day. Obviously, one restaurant cannot change Nigeria. There’s a lot of aspects to it. You need to give people an option, you cannot just tell them “become vegan” and then they think they have to eat salads. Because that’s the perception right now. People want to know what they can eat, because you want to take away their meat, and then they eat eba with soup with nothing in it, it becomes frustrating. You want to win people. If I stand here and preach about veganism it would not help. I believe you need to let people see and taste how the change in lifestyle would look like. And that’s why we have the restaurant to show them that, “hey, you can have your egusi with meat in it, but it’s really a meat replacement.” Nine out of ten people love our meat, and those are meat eaters. We’re not selling to vegetarians, in fact, only a few. In our four years, nine out of ten of our customers are meat eaters. They love the meat. Especially children. So, you need to show them how the new lifestyle would look like, and then you need to make that product available. Because if they know they have to eat a plant-based diet but they don’t have it, then they’re still stuck. It’s a mixture of providing a product (meals) and then awareness campaigns. Like the veg fest which is coming up this month. This month is also vegan month. The Lagos Veg Fest is in its third year, and it’s free for people to come and see what Nigerians are already doing. It’s not only Veggie Victory, we always have like 25 exhibitors that all deal with the vegan lifestyle. And it’s not only food, there could be other products like cosmetics or clothing that don’t use any animal products. VA: We know the benefits of a vegan lifestyle. Would you say there are any demerits (challenges)? HJ: Well, compared to eating meat it’s an overwhelming positive, but you need to pay a little attention to your food, in terms of balance. There’s what people called ‘junk vegetarians’ or ‘junk vegans’. If you eat sweets the whole day, you can be vegan, but it’s not healthy. Finding balance is not that difficult, but as a vegan, you need to get Vitamin B12. That’s really it. I don’t know of any other issues, as you’re high on proteins and other vitamins. If you eat only eba, or you drink garri and groundnut, you’re a vegan, but you’ll have deficiencies (laughter). So, I can’t really think of any downsides. It’s better for the environment, it’s better for your health, you save medical costs because you’re not getting sick… what else? VA: Do you own any pets? HJ: No. I grew up with a Dutch German Shepherd, but I know the responsibilities. My first daughter in America has a dwarf rabbit. Here, we were thinking about a parrot, but then I don’t like the cage, a cat is too difficult… so I think we are good without animals. I love them. At the veg fest, there’s one exhibitor that sells pets and we try to get people to interact with animals. A lot of people don’t know animals. That’s probably the noblest part as a vegan – you start appreciating life because there’s no point being friends with a dog and killing a goat. But then I don’t want to push that topic because people get it wrong. There are books written about it. VA: Would you refer to yourself as an animal rights activist? HJ: I leave that to others. I’m compassionate about them. Funny enough, once I became a vegetarian, I discovered there’s a non-communicative way with your environment and animals. I’m happy about my relationship with animals. Some animals go to some people and not to others, and if you just become more sensitive to that, it’s beautiful. This blood-shedding affects all of us. Like children feel bad when the goat they were just playing with last week is killed. It’s cruel. Children make friends with animals not to eat them, and it can really traumatise a child if they know that you will kill the animal. Humans just see a piece of meat in the stew and eat it, they don’t see the animal behind the meat. But, I think we’re getting there. VA: What outcomes do you hope could be achieved on World Vegan Day this year? HJ: Let’s be realistic, it’s not going to be broadcast news, so most people will not even know that it’s happening. Also, it’s not like Christmas for me that I’ve been waiting for. But I’m happy that some people – like you, it was really nice that you thought about it and dedicated your time. A few people would notice that. On the part of the restaurant, we doing a sale today. Every food comes at half its price. We’re also doing a promo on the VegMeat. World Vegan Day is great, but for us, every day has to be vegan anyway. We keep on spreading the news with the Lagos Veg Fest, and if more people hear about it, fantastic. The Lagos Veg Fest is happening from the 18th to 20th of November at the Freedom Park, Lagos Island.